The HL.RL-85-LED-CPR 6 million candlepower rechargeable handheld spotlight from Larson Electronics is lightweight, ruggedly built, and features a rechargeable lithium ion battery. What sets this LED spotlight apart from other models is that it charges while it is plugged into a 12V power source even when it is in use. 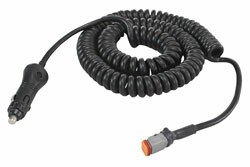 The cord can be detaached from the light by disconnecting it from the weatherproof disconnect to use this light like a rechargeale unit. Designed for both functionality and convenience, the HL.RL-85-LED-CPR allows operators to roam freely without the hassle of being plugged into a power source at all times. This unit uses a premium Cree LED and a parabolic reflector to generate an impressive 2,000 lumens while drawing a modest 25 watts of power. This powerful IP65 rated spotlight is ideal for hunting, camping, marine and boating use as well as for first responders and emergency services. Light Features: The HL.RL-85-LED-CPR 6 million candlepower rechargeable handheld spotlight delivers an impressive 2,000 lumens while drawing only 25 watts of energy. In combination with a single high output Cree LED and a parabolic reflector, this light cuts through the darkness with an ultra-focused 30° spot beam that clearly and sharply illuminates objects all the way to the end of the beam reach. 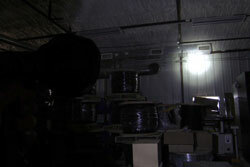 The Cree LED units in this light have been chosen for their high lumen per watt ratio and extreme longevity. These Cree LEDs generate 80 lumens per watt and have a 70% lumen retention at 50,000 hours, giving them better efficiency and operational life than traditional light sources. This IP65 rated spotlight features an ultra-durable ABS shockproof polymer body, an aluminum alloy light head housing, and an impact resistant polycarbonate lens. While the HL.RL-85-LED-CPR is built to withstand rugged use and harsh outdoor conditions, comfort and ease of operation haven`t been sacrificed. This unit is ergonomically designed for balanced and comfortable handling. The nylon handle has a no-slip textured surface that ensures a firm grip even in wet conditions. The booted push button is conveniently placed to allow operators easy forefinger access to the switch for quick on/off action. 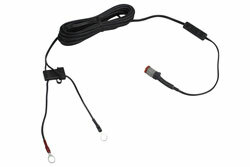 Larson Electronics offers additional options for the HL.RL-85-LED-CPR spotlight, including red and green lenses. For more information, contact sales@larsonelectronics.com. 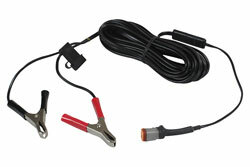 Charging Function: The HL.RL-85-LED-CPR features a unique charging function that allows the spotlight to be charged while it is plugged into a 12V power source, such as a vehicle`s power socket, and while it is in use. 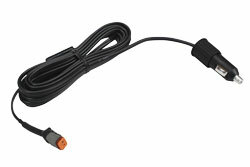 The cord can be disconnected at any time to turn this unit into a rechargeable unit. Once the spotlight is unplugged for portable use, it will offer operators an equivalent battery life to however long it was plugged in for. For example, if the LED spotlight was plugged in and being used for one hour, the battery would then have one hour of portable use available. Once the battery dies, the HL.RL-85-LED-CPR can immediately be plugged back in for battery recharge while still being able to be used as a normal 12V spotlight during the recharging process. Power: The rechargeable HL.RL-85-LED-CPR spotlight comes equipped with two 3.7V 2600MA lithium batteries and is recharged via a 12V power source. This light has a work time of 2.5-3 hours on a single, full charge. Recharging from a fully discharged state takes 3 hours. 3. Nylon and aluminum alloy body.